The NBA regular season is more than a quarter finished, but the Rookie Rankings refuse to settle down into any form of stability. This week, there are more newcomers to the top 10, thanks to a couple first-year big men who are starting to receive more playing time. New Jersey Nets rookie MarShon Brooks also missed most of the week with a fractured toe, which led to the introduction of the Rookie Rankings injured list. Since Brooks was inactive, it doesn’t make sense to keep him in the rankings. But it would be unfair to simply banish Brooks, who had a stellar season before his injury. So we put him on a shelf for worthy rookies who are out with injury. When Brooks returns, we expect him to return to the list. Irving is pulling away from Ricky Rubio as the NBA’s top rookie. Irving has managed to play surprisingly efficient basketball for a first-year point guard because he finishes at the rim. This is impressive. Many NBA guards never figure out how to convert shots in the lane at a high rate; Irving, who is listed generously at 6-foot-3, seems to have a knack for getting to the basket and scoring there. According to Hoopdata.com, Irving shoots 63 percent at the rim. This puts him in similar territory with Derrick Rose (62.9 percent), Tony Parker (62.4 percent), and John Wall (58.6 percent). In fact, Irving scores 1.292 points per possession near the rim, which puts him in the top 20 percent of all NBA players, according to Synergy Sports. 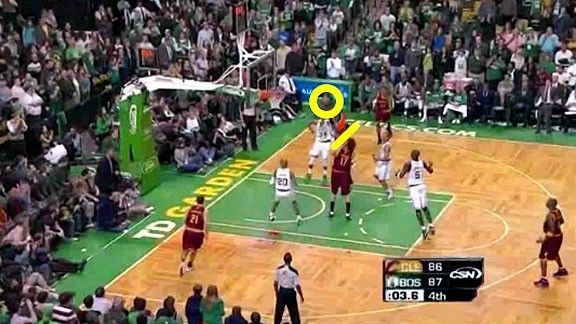 Irving is an elite finisher because he squares his body to the basket very well. Usually, when he drives to the rim, he gets his shoulders parallel with the backboard, and that little fundamental step makes his shots easier to convert. 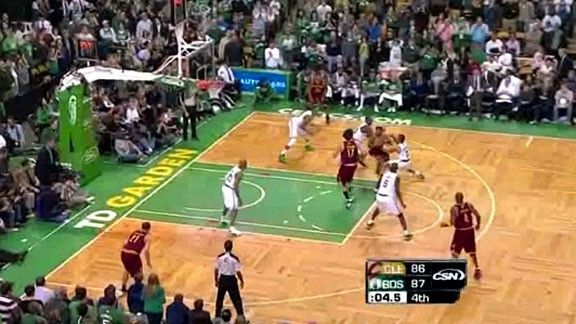 For example, let’s look at Irving’s game-winner on Sunday against the Boston Celtics. After coming off a ball screen, Irving splits the pick-and-roll with a spin move, getting by his man and around the help defender, Brandon Bass. After the spin, Irving doesn’t just fling up a shot. Instead, he gets his shoulders square to the backboard and rises for the layup. Squaring up is important for a shorter guard like Irving because it allows him to protect the ball. Here, Irving shoots with his left hand while Bass tries to bother the shot on his right side. Because Irving is squared up, his body shields the ball from Bass, who can’t get close enough to block Irving’s shot. If you’ve seen the highlights from the weekend, you already know Irving converted the game-winner. Here are a few more Irving finishes at the rim. Thanks to Irving’s proper technique, his shots don’t get blocked. He also creates contact and draws fouls because weakside shot blockers have to go through his body to block Irving’s shots. Squaring up to the rim is a key skill for smaller players who penetrate and look to score, and Irving seems to have mastered it early in his career. Before Rubio entered the NBA, several scouts noted that he was a very good defender off the basketball, but they thought he would be too slow to stay in front of NBA point guards when they isolated against him. The scouts, however, mostly failed to notices Rubio’s wingspan, which DraftExpress mentions is around 6 feet 9 inches. His long arms help negate his lack of foot speed. He can challenge shots while staying farther back, and this makes it easier for Rubio to stay in front of his man. What’s the result? Taking charges on the perimeter. In isolation situations, Rubio holds his man to 0.568 points per possession on 25.9 percent shooting. That places him among the top 20 percent of all NBA players. Rubio also forces turnovers 16.2 percent of the time when offensive players isolate against him. Of those turnovers, all but two have been charges taken on the perimeter. In fact, Rubio is third among players in terms of charges taken, according to Hoopdata, with 0.90 per game. Most of the following charges were taken on the perimeter. This is all because of Rubio’s wingspan. Rubio doesn’t use speed to stay in front of his man and take charges. Instead, he uses distance. Rubio’s arms are long enough to bother shots even when he plays his man a step back. His opponents don’t seem comfortable playing against Rubio. It’s as if they don’t know how to react, and instead they just barrel into him and commit offensive fouls. Knight’s turnover travails might be the closest thing this column has to a running feature. He still gives the ball away on 19.6 percent of his possessions, but at least Knight is taking better care of the ball in pick-and-roll situations. He is limiting his turnovers when using ball screens while also improving his pick-and-roll decision making. Right now, Knight seems to have figured out when to pass to the roll man and when to kick the ball out to a spot-up shooter after he comes off ball screens. Knight is becoming more patient in pick-and-roll situations. Instead of putting his head down and trying to get to the rim at all costs, he keeps his head up and looks for his teammates. This is helping Knight to read and react to defenses, and increasingly he’s finding the open man for an easy basket. In the past, we’ve noted that Shumpert was only playing 14 percent of the Knicks’ minutes at shooting guard, despite the fact that he produces far more efficient numbers at that position than at point guard. That number has crept up to 19 percent of the Knicks’ shooting guard minutes, according to 82games.com. Accordingly, Shumpert’s play has improved. On this play, Shumpert penetrates and kicks the ball to the wing before running to the weakside wing to space out the court. Shumpert doesn’t just stand on the perimeter and spot up for a jumper. 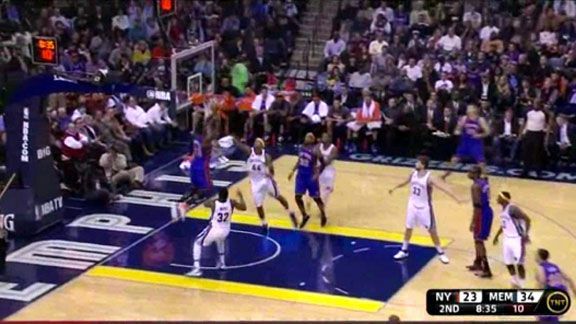 Once he sees his defender turn his head to focus on the basketball, Shumpert dashes to the rim. A good pass leads to an easy dunk for Shumpert. The more he can play off the ball, the more he can survey situations like this and create scoring opportunities. Few rookies have had a more up-and-down season than Walker. He has played his way back into the rankings by filling in ably for the injured D.J. Augustin as the Charlotte Bobcats’ starting point guard. Walker has been able to carry over his success in isolation situations from college to the pros, something that some scouts doubted he would be able to do. Walker only gets to the rim on 27.5 percent of his isolation possessions, but he has managed to be efficient all the same by making 50 percent of his pullup jumpers in one-on-one situations. Walker uses his speed off the dribble to create distance between himself and his defenders. Another key to Walker’s success is the quick release on his jump shot. Small guards like Walker only have a brief opportunity to get their shots off before defenders recover and bother their shots. Walker’s shot has been quick and accurate of late. For most of the season, Leuer probably received the most consistent minutes of any rookie. He had been playing about 25 minutes per game for the Milwaukee Bucks, until last week, when his minutes almost flatlined. In his last four games, Leuer played three minutes against Houston, 20 against Chicago, and six against the Lakers, and he pulled a DNP-CD against the Hawks. In 20 minutes against the Bulls, Leuer put up 19 points and five rebounds. If he’s putting up those kinds of numbers and still can’t get on the court, that means he must be doing something wrong. Since Scott Skiles is Leuer’s coach, it’s fair to assume that Leuer’s struggles are on defense. Right now, according to Synergy, teams shoot 46.7 percent when Leuer is the big defender in pick-and-roll situations. Skiles, a defensive stickler, won’t settle for that. Morris also needs to be a better defender. As impressive as he has been as a low-post scoring threat, Morris has been equally bad at defending the post. At the time of this writing, Morris was giving up 1.185 points per possession, which puts him in the bottom 6 percent of all NBA players. Opponents are shooting 63.2 percent against him. To make matters worse, Morris fouls and sends his man to the free throw line 18.5 percent of the time when he defends the post. Morris doesn’t have great size for a big man, and while that hasn’t hurt him on offense, it’s killing him on defense. The more I watch Kawhi Leonard play for the Spurs, the more I marvel at his ability to move without the basketball. Leonard isn’t known for his offensive skills, but he posts impressive numbers thanks to his activity away from the ball. We’ve discussed his cutting and offensive rebounding, but Leonard also excels at working off screens. His points per possession of 1.091 when using screens away from the ball puts him in the top 17 percent of all NBA players. All this offense coming from Leonard is an added bonus to his defense and offensive rebounding. Thompson still posts the highest points per possession on spot-up jumpers without a dribble in the entire NBA. He makes 65.2 percent of his shots in these situations. Considering how well Thompson shoots the ball, he should probably post better numbers when working off screens. Right now, Thompson shoots 50 percent when coming off screens away from the ball, but he only scores 0.944 points per possession on those plays. That’s worse than two-thirds of the NBA. Thompson’s problem is that he commits turnovers 16.7 percent of the time when he uses screens away from the ball. He’s doing a poor job of setting up screens and coming off them sharply. He’s not getting open enough to catch and shoot in these situations, which means he has to dribble to create a shot. That’s taking away from his strength as a spot-up shooter and leading to more turnovers. Kanter makes his first appearance in the top 10 thanks to his board work. The Utah Jazz big is fifth in the NBA in offensive rebound rate and fourth in overall rebound rate, according to Hoopdata.com. The Jazz must be especially pleased that Kanter is taking those offensive rebounds and converting them to points. He shoots 60.7 percent on putbacks, according to Synergy Sports. Kanter remains low on these rankings, however, because he isn’t skilled enough to do much else on offense. 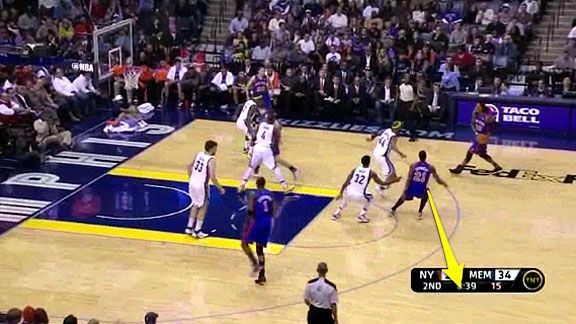 He’s still very raw, but Kanter is struggling to score, especially on the block. When Kanter posts up, he scores 0.474 points per possession. That number is in the bottom 5 percent of all NBA players. He also shoots 24.1 percent in the post. Did I mention that he’s 6-foot-11? 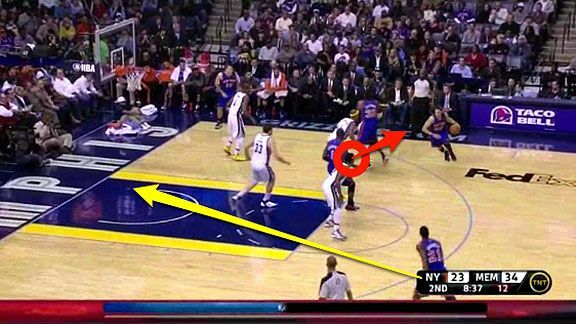 Kanter doesn’t have any moves in the post. Instead, he tries to put his head down and bull his way to the basket, but that doesn’t work in the NBA. If Kanter can develop a go-to move on the block, he could become a scary player in this league.